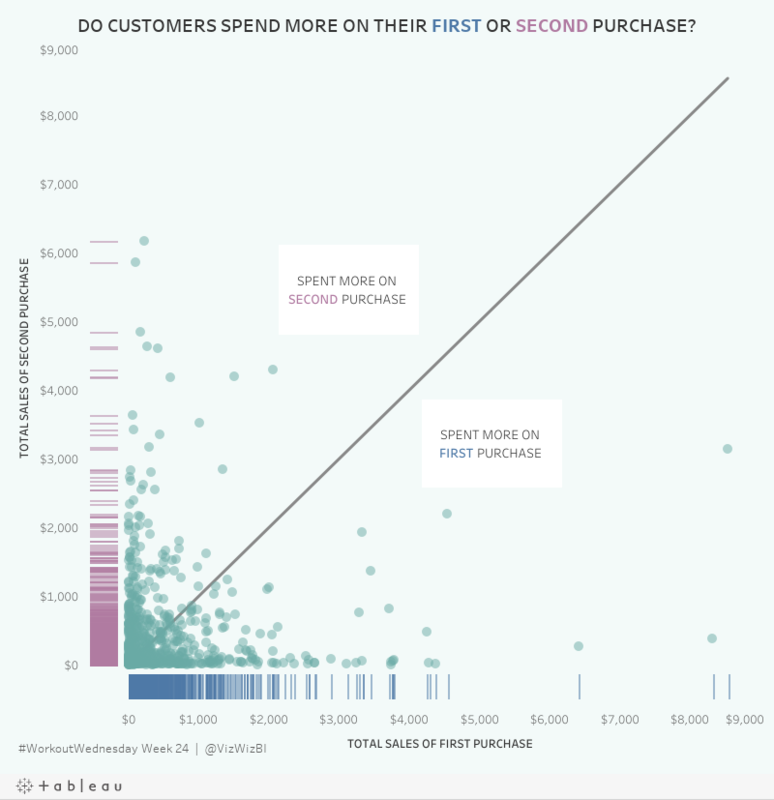 Workout Wednesday: Do Customers Spend More on Their First or Second Purchase? Ann is back for Workout Wednesday week 24. The full list of requirements can be found here. Personally, I like how this week's challenge included Tableau Prep. It's great to have an excuse to practice! Create a data set in Tableau Prep that returns the first and second order for each customer along with the sales, number of categories and number of products sold on that day. The data must be wide rather than tall. That is, you must have nine columns in total: Customer ID, two dates, two sales totals, two category counts, two product counts. Create a dashboard with a scatterplot and two strip plots. I intentionally did NOT rename my tools so that you wouldn't know exactly what I did. You can see my final output below the flow. Building the viz was pretty simple. Scaling the axes the same is something I do a lot, but I do expect that to trip up people. Creating the 45º line is something I've written a tip on before, but Ann's has a twist as it has to be behind the dots. Sneaky! The sucky part was floating everything. I started by tiling everything, literally writing down the position and size for each element. Then I floated them one by one and entered what I wrote down to put them back in their proper position. From there, it was a little bit of tweaking to move the axes closer together. Nice challenge. It wasn't overly complex and required me to reach back into the memory bank.